Here you will find a selection of commissioning results with the Boolardy Engineering Test Array (BETA) - a test array made up of the first six ASKAP antennas at the Murchison Radio-astronomy Observatory to be installed with CSIRO's first generation phased array feed (PAF) receivers. While BETA was primarily a commissioning instrument intended to help the team prepare for the fit-out of the full ASKAP telescope, some early science was also possible. Click on the images below to find out more information about these results. LIGO makes waves, Australian telescopes follow up, March 2016: How ASKAP played a part in LIGO's hunt for gravitational waves, and showcased capabilities offered by the transient survey projects planned for the future. 'Exotic pulsar' theories confirmed by BETA, December 2015: The latest paper to be published from ASKAP has used commissioning data to confirm theoretical predictions of an ‘exotic’ intermittent pulsar almost 6,000 light years away. 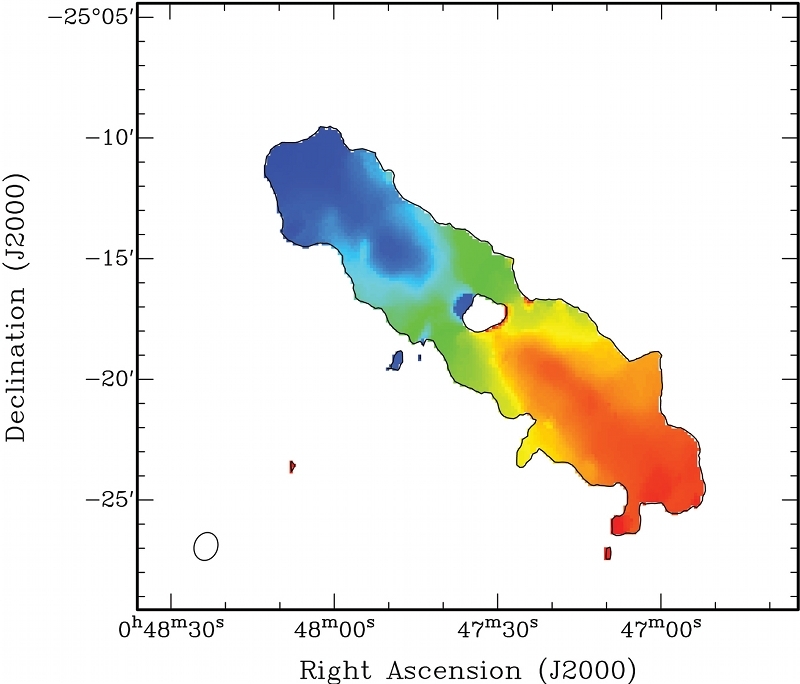 First ASKAP paper detects 'cloudy' galaxies, July 2015: In what is the first scientific ASKAP paper accepted for publication, BETA commissioning data has mapped the IC 1459 galaxy group, resolving HI emission in eleven galaxies and discovering three previously unknown HI clouds. ASKAP discovers HI absorption in distant galaxy, July 2015: ASKAP has opened a window to a little-explored period of the Universe’s history, using a special technique to spot a galaxy five billion light-years away. 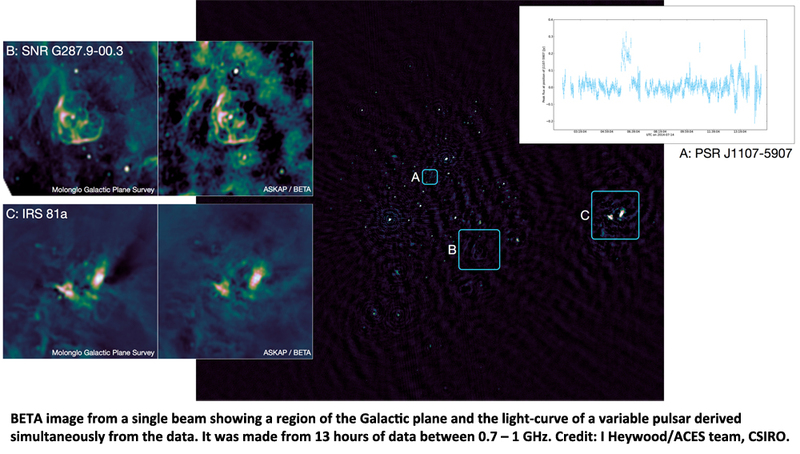 Search for transients aids BETA commissioning, January 2015: To demonstrate the rapid, wide-area survey capability of the Australian SKA Pathfinder (ASKAP) telescope, a new image of the Tucana constellation has been produced, over three times the size of previous efforts. 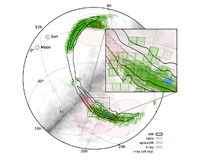 Widefield continuum and polarisation capabilities demonstrated with BETA, December 2014: The ASKAP team has successfully demonstrated widefield continuum imaging with the ASKAP phased array feed (PAF) receivers installed on the Boolardy Engineering Test Array (BETA); the image files are now available for interested users. 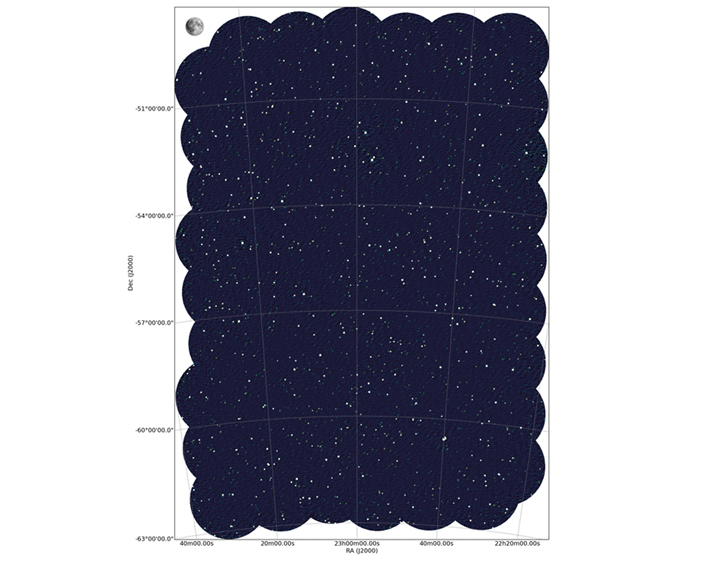 New image demonstrates rapid survey capability of ASKAP, September 2014: A new image generated with BETA covers 50 square degrees of the sky, revealing over 2000 sources and demonstrating the rapid survey capability of ASKAP. The radio image of the Tucana region is shown, across the 711-1015 MHz band. Steerable beams create flexible 'footprints', September 2014: BETA has been used to image HI in the galaxy group IC 1459, at a distance of ~30 Mpc. 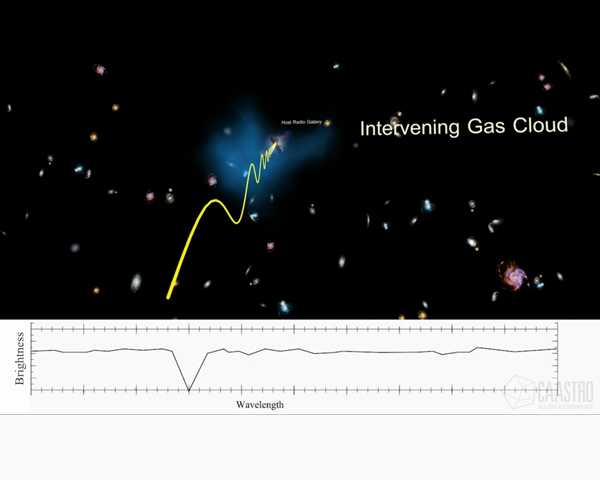 This group hosts numerous galaxies and is an ideal target for studying galaxy evolution in dense environments. 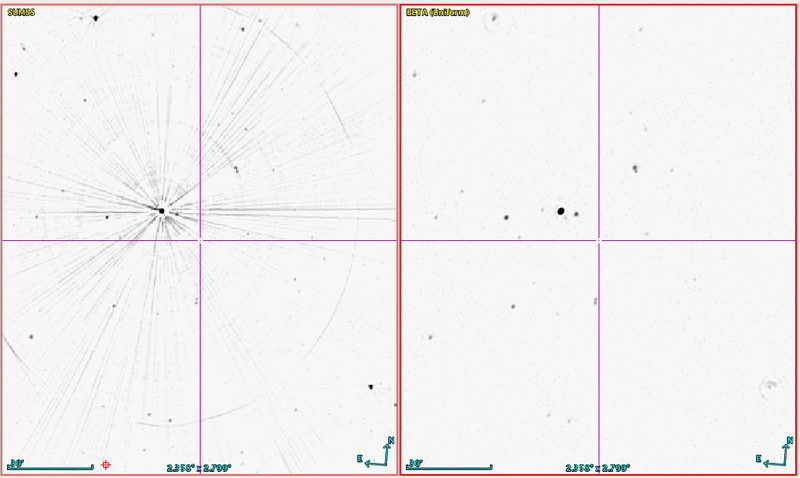 Six galaxies were detected; details of each of the six detections show that the HI and its rotation are well resolved. 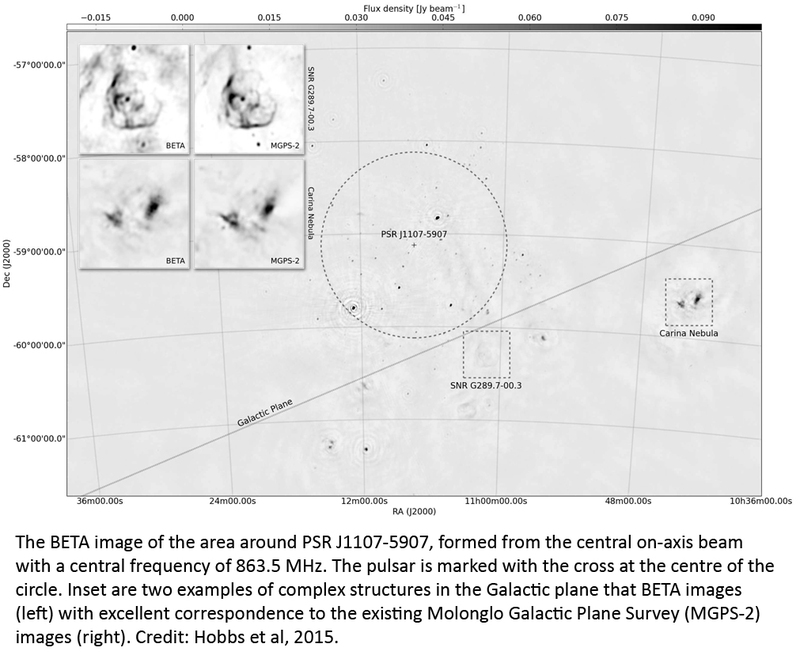 BETA demonstrates clear benefits of ASKAP antennas' third axis, September 2014: Observations of a standard test field containing numerous bright sources were made with, and then without, the roll axis engaged. The results show that with the roll axis disabled, the corresponding observation demonstrates significant errors, whereas using the roll axis leads to a significant improvement in the achievable dynamic range of the images. 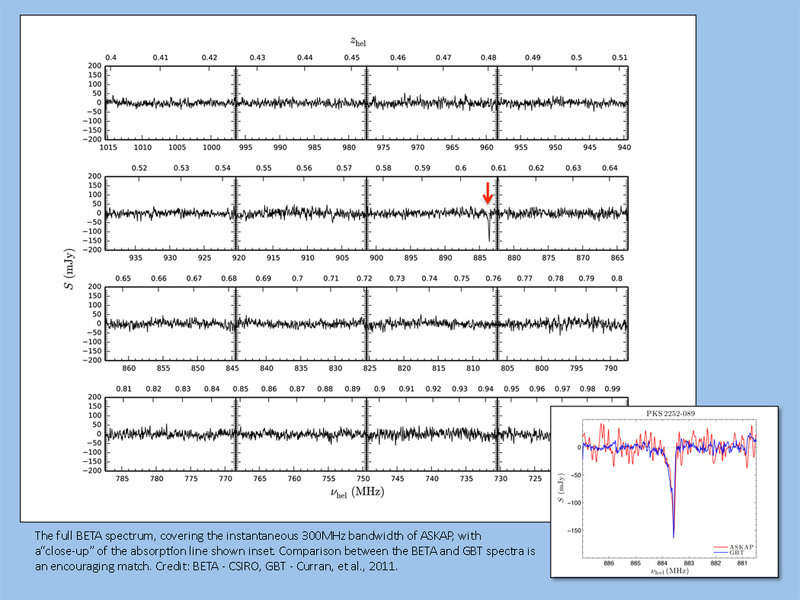 Demonstration of ASKAP (BETA) transients observing capabilities, August 2014: with an intermittent pulsar located in region A, BETA can detect the pulsar entering its active state on three separate occasions during the observation. 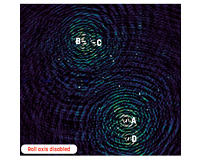 These events were confirmed by a simultaneous observation with the Parkes telescope. 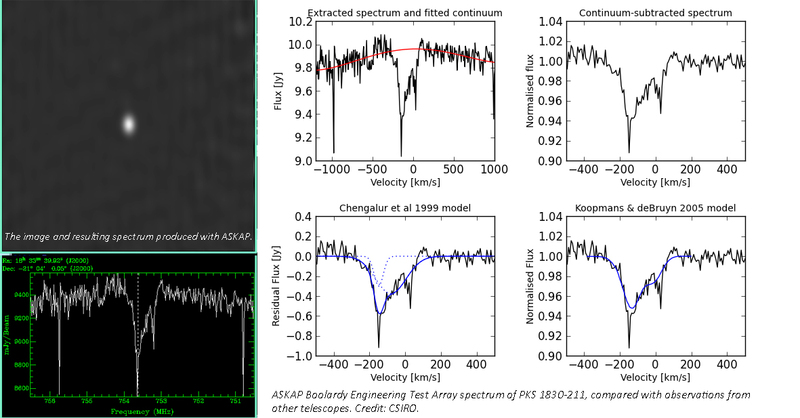 First VLBI with ASKAP (BETA) PAF, July 2014: The first demonstration of VLBI using an ASKAP phased array feed and the Australian LBA. This image shows 0537-441 made with data from the Aus LBA (Parkes, ATCA, Mopra, Ceduna), with and without the inclusion of data from a single ASKAP antenna. 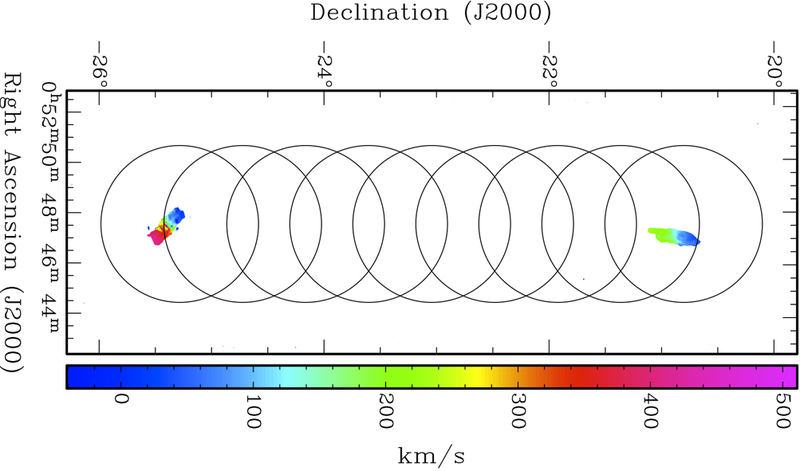 Demonstration of HI absorption science with BETA, July 2014: Observation of the 1 Jy radio galaxy PKS2252-089 using the 712-1015 MHz band of BETA; the (known) absorption line associated with HI gas intrinsic to PKS2252-089 can clearly be seen at 884 MHz. 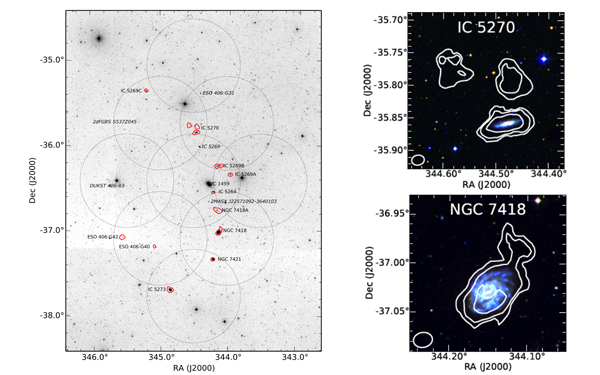 First multi-beam observation of extragalactic HI with BETA, July 2014: a preliminary image of a HI velocity field obtained from a nine beam BETA observation of a region of the sky including two galaxies, NGC 253 (south) and NGC 247 (north), which are 4.5 degrees apart. 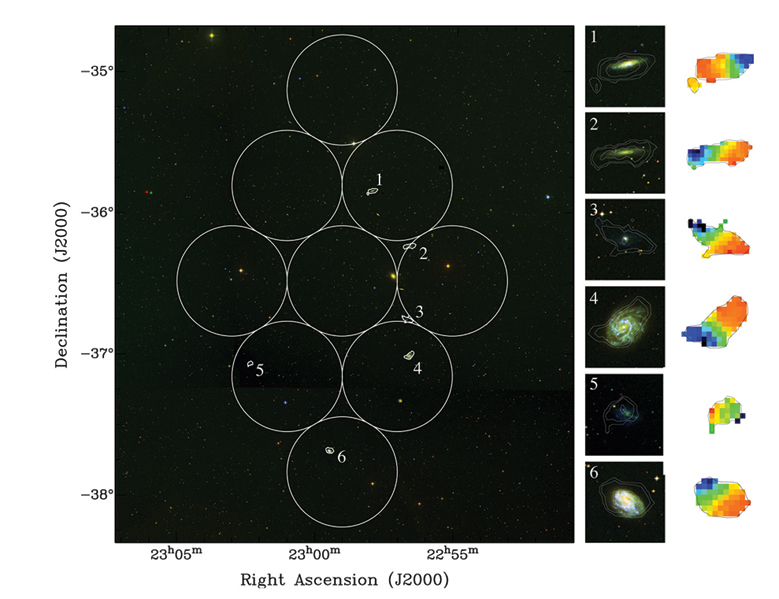 The 9-beam footprint was arranged in a straight line to observe both galaxies at once. 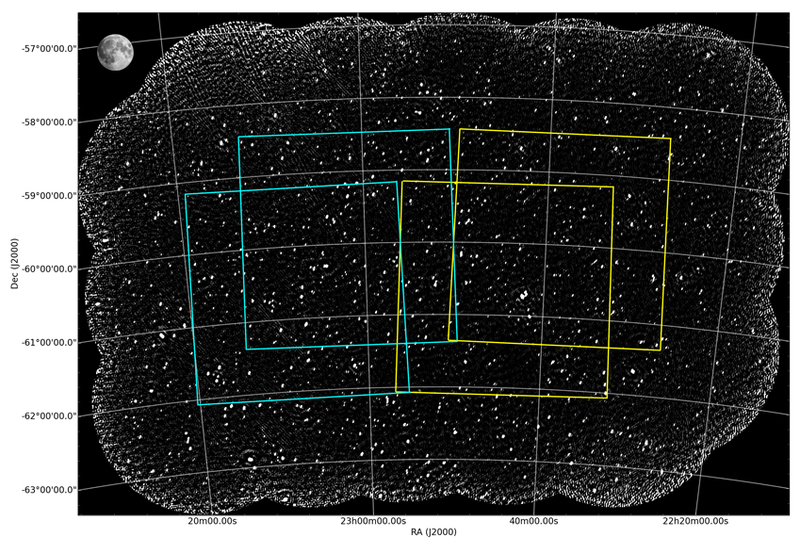 Continuum imaging with BETA, June 2014: A 12-hour observation of an ASKAP test field shows a number of distant galaxies, with the Moon shown to scale. The circles indicate the nine overlapping 'beams' from which the image was created. 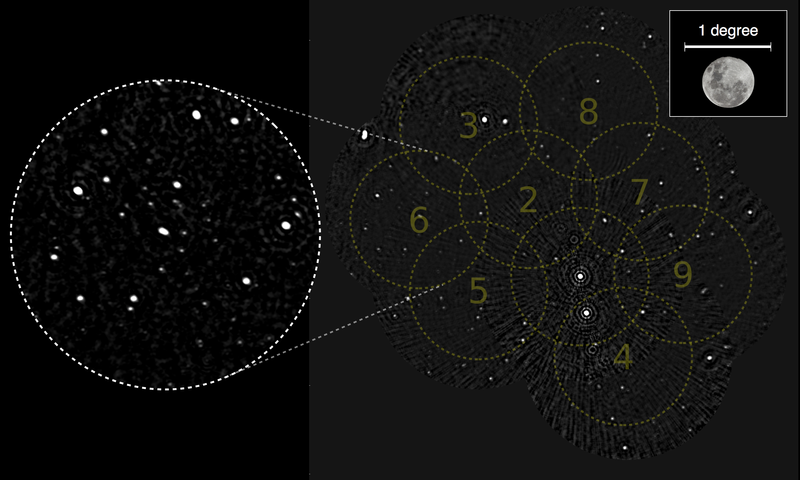 Demonstration of BETA imaging capabilities, June 2014: Neutral atomic hydrogen gas (HI) from the NGC253 galaxy, capturing both the intensity of the radio waves and how the galaxy is rotating. This ‘snapshot’ was made in over just 11 hours. 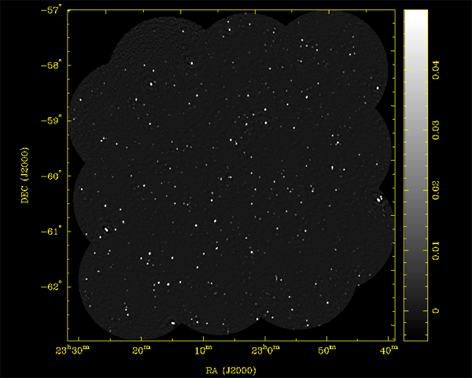 Initial exploration of ASKAP imaging capabilities, May 2014: an excellent comparison between ASKAP commissioning data and data taken from the all-sky Sydney University Molonglo Sky Survey (SUMSS) demonstrates the high sensitivity and dynamic range of BETA (using just one beam), with all main sources being clearly visible in the comparison image. First spectral line 'data cube' produced with ASKAP, April 2014: up to six hours of data was collected and analysed to create the first spectral line image with the ASKAP system, made using all 15 baselines from BETA at the array's full spectral resolution of 18 kHz. The data was made publicly available for download. Download the latest edition at the ASKAP Commissioning Update page. To receive future updates please email Dr Aidan Hotan, ASKAP Project Scientist, to subscribe. More: Latest ASKAP News page.